The melancholic tone breathed out by stroking the finely tuned strings with the bow, resonated a sense of loss, sorrow and desperation. It traversed through the valleys of history, centuries back in time and finally mingled with the chord of sorrow, repentance and desperation played on the instrument by its original player; the King Ravana. The young and vibrant musician ridden with anxiety pledges to undertake such a journey to excavate the buried 'roots' of music and its history. "The primary version of the violin which the West boasts of to be their creation was first played by Orients. The first ever reference made to a music instrument is found in the Ramayana. The centuries old epic says King Ravana played a stringed instrument called Ravanahatha, similar to the violin," he says. Dinesh Subasinghe, an artiste who looks forward to carve a unique niche with his talent in the local and international music arena, claims that history has to be rewritten. Sri Lankan music has to assert its identity in the global context and it should begin by correcting history, says the promising musician. Subasinghe has emerged a player of enormous potential as he has proven his talents in music direction, composition and a performer of many instruments. However, above all he strongly believes that we can strike a different chord in the music arena with oriental instruments like Ravanahatha and Kingiri which have not yet been accepted and recognised. "These instruments are used only to play folk tunes. But the music generated by these instruments reflects the emotions and features of the orient. Thus, it is an excellent medium to promote our music," Subasinghe explains. Ravanahatha and kingiri made out of coconut, bamboo and goatskin, trace their origin from the East. The great epic Mahabharatha says the wife of a demon gifted the kingiri to Bhim, one of the Pandavas for saving her life and by playing the instrument, they invoked nature and natural elements, the artiste said. Dinesh Subasinghe playing the ancient instrument Ravanahatha. "A similar instrument to ravanahatha and kingiri, known as kamaicha was played by Egyptians and in North India Rawanahatha is played by gypsies. I am highly interested in tracing the relation of this and finding proof to assert our identity in the history of music," the enthusiastic musician revealed his passion to explore. Having excelled in all genres of music from classical to baila to rap, Subasinghe does not discriminate. While leading the latest creation of Maestro Premasiri Khemadasa's 'Agni' opera, he composes for teledramas and movies. "I have composed music for 19 teledramas, 'Siri Siri Mal' and 'Shobha' being on the top of the list." His music composition for teledrama began with Hummanaya. 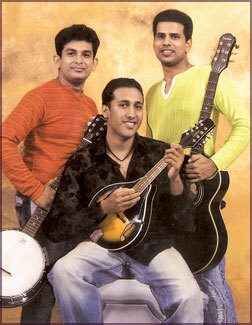 Subasinghe has undertaken music composition for Channa Perera's new movie too. 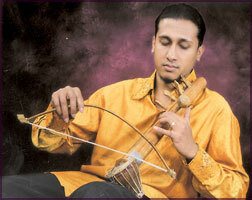 He will soon release a CD of instrumental music, based on rawanahatha and kingiri. His first media performance came in 2003 with the Dee R Cee Members, a popular youth band led by him. Monalisa was the first hit of the Dee R Cee Members. He was born and brought up in a family with musical background. His father was in the Sri Lanka Navy Band. His younger brother taught him to play the violin. He honed his talents being in the church choir and his school St. Peters' College bundled up many opportunities for him to excel in singing and composing. Meeting veteran musician Stanley Peiris opened golden gates for Subasinghe as he introduced the talented youth to professional orchestra. Later Ananda Dabare and Hasini Halpe put him in the symphony orchestra. After he joined Khemadasa, for seven years he has been playing for every composition of the maestro. However, the young artiste who has reached many heights in a short period says he will not rest on his laurels. "Still I have not got satisfactory feedback for my talents. It is the common phenomena in Sri Lanka today when the music field is controlled by a few. Musicians own no place in this situation. They will promote what sells and not what people demand," he said. All music genres should be promoted and treated equally. Though the country possesses so much talent, it is not represented in the correct way. If only one or two types are highlighted that will cause the downfall of our music. Unity and harmony is important to walk a long way, the artiste explained. "When Sri Lankan players perform abroad, the audience is filled with Sri Lankans. But if A.R. Rahuman or another reputed personality performs people of various nationalities throng the venue. Why such a difference? Do we lack universal appeal in our music? If we are to reach that level we need to present something unique and we have to assure quality in our performance," Subasinghe concluded.